For my entire life, as one living in my home country, I have always read such texts with the lens of being the insider, the one charged with welcoming others with hospitality. Over the last five months, I have gained a different lens, as one who is the recipient of this hospitality. I am the stranger. I knew when I was preparing to go to Japan that this would be the case. I knew I would not look like most people, or speak like most people, or maybe even think like many people. But then I got to Japan, and even the smallest details of life had a way of reminding me that I am a stranger here. After four months of biweekly Japanese lessons, I am still very much illiterate. I can barely speak Japanese in complete sentences. I’ve walked out of stores nearly in tears because I couldn’t quite figure out what kind of flour I needed, or whether that can that looks like tuna was really a can of tuna, or whether these trash bags will fit our trashcan. Talk to Carson about trying to find snow boots (a necessity here) that fit his American-sized feet. I’ve used Google Translate more times than I’d care to admit, for everything from reading receipts to trying to translate kanji characters on our home appliances when something goes awry. While there is always the awe, and even joy, of learning new things in a new place, there is also the challenge of recognizing the many steps it will take to feel like you belong, just a little. Carson and I have been fortunate to have people in our community who have taken seriously what it means to welcome the stranger. While it’s been difficult to adjust, the gestures of hospitality have made all of the difference in this beginning to feel like home. One church member labeled our appliances and their primary function buttons with English words written on tape. We’ve had our pastor and church members take us to the doctor. Our pastor has recently made a goal to write a summary of each Sunday’s sermon in English for the handful of non-Japanese speakers who attend the services. We have consistent offers from church members and mothers of the church’s kindergarten students to help us practice conversational Japanese. We have experienced store employees exercise the utmost patience with our broken Japanese, even attempting to speak their broken English with us. We’ve been invited into homes, shown how to cook Japanese food, and taught how to drive on the left side of the road. Where would we be without the kindness of these insiders? Carson and I have already reflected on how these first months in Japan have changed our perspective on what it means to welcome the stranger. It has given us a renewed desire to welcome other strangers here in Japan and become more conscious of ways to be helpful to them. It has given us future hope in the love and hospitality we can share when we eventually return to the U.S. and to our role as the insider. We understand now that even the simplest acts can have great impact in making someone feel welcomed. Because once you have been the stranger, I imagine part of that will always stay with you, even if you do make your way back home. 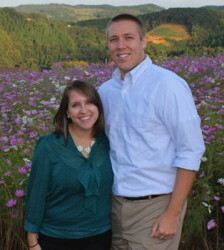 Carson and Laura Foushee are Cooperative Baptist Field Personnel living in Kanazawa, Japan. Both natives of North Carolina, Carson and Laura met at McAfee School of Theology after graduating from Elon University (Carson) and N.C. State University (Laura). Carson’s passion for global missions and Laura’s passion for the local church have blended together as they serve in Japan through English language education and through Kanazawa Baptist Church as co-pastors of its international congregation. They can be reached by email at clfoushee@thefellowship.info. Feel free to also to check out their website and the Kanazawa International Baptist Church website. So beautiful. Thanks for sharing. I love reading all that is posted from you.